My family celebrated Christmas over Thanksgiving this year (long story), so all of us descended on my aunts’ house for four days of food, togetherness, and… gaming. My family has always enjoyed playing games together–first trick-taking games like Pinochle and Rook, then party games like Scattergories and Rapid Recall, and now hobby games, beginning with Acquire. There were fifteen of us at the gathering, and we played a lot of games over the four days. I usually list what I’ve been playing in the weekly news, but I thought I’d write a separate post since several of these are new, and I’d prefer to treat them in more depth. So here’s what we played. I brought Click Clack Lumberjack along because I wanted to try to include my nieces in the games this time around. (Usually they sit off to the side or sit on the adults’ laps but don’t participate because they’re too young–four and two.) I thought at least the four-year-old could handle Click Clack Lumberjack, and I was right. There were a few issues with her hitting the tree too many times or getting angry when she lost, but she mostly did an admirable job and enjoyed playing this one. And I enjoyed having something that I could play with her. The two-year-old played and enjoyed herself, but she didn’t get the concept very well. I think she’ll be better equipped to play the next time I see her. This was one of the surprise hits of the gathering, and it’s easy to see why. Coloretto is an excellent game, first off. It’s short and simple, but there are still very interesting decisions to be made. Each game turn involves a binary choice: draw and play a card to a card row, or take a card row and wait for the next round. Each card row can hold a maximum of three cards. Each player’s top three colors count positive at the end of the game; all other colors count negative (according to the included score table). That’s it. There’s a small push-your-luck element to the game, which keeps it exciting, and the gameplay isn’t so taxing that players can’t chitchat. But what really made this one a hit is that it’s reproducible. I taught the game one night to two other players, and the next day, one of those players was teaching another group like a pro. And then one of those players taught it. And so on. It seemed there was always someone playing this. My brother-in-law requested that I bring this one. In Get Bit!, players simultaneously choose a numbered card from their hand in order to try to outswim their friends, who are being chased by a shark. I knew this would work with the adults, but I didn’t realize how well it would go over with my niece. She wasn’t very good at the game (which didn’t help her mood while playing), but she did play, and it was nice having her at the table with us. Get Bit! remains a filler staple, a fast and fun game that still offers good decisions in a short time frame. I recently got this auction game from Stronghold Games. It’s a real-time auction game, much like the auctions you see played out on sitcoms for laughs with the fast-talking auctioneer. In Going, Going, GONE! players bid on five simultaneous auctions by dropping cubes (“bucks”) into cups–the player with the most cubes in each cup wins the lot up for auction. The concept is super simple, and the game was a blast. The auctioneer’s paddle, true to what I’d read in the forums, broke in the first game we played, but that is a minor inconvenience. This game succeeds as a party game, though it works best if all players have equal access to the cups. (The request to sit in comfy chairs undercut some of the game’s effectiveness, I think.) I’m eager to play this one again. This game was a hit over the summer, so I brought it back for Thanksgiving, and it saw some play. After our games of Council of Verona, my sister, brother-in-law, and I played this. My sister has played before, but my brother-in-law was new. Our first game we scored 21. Granted, this isn’t a spectacular score (as you begin to realize the more that you play), but it’s a good score, especially when it’s another player’s first game. This excited us, and we were going to make a go of it, trying to work our way up to 25, when two other players joined the game. They were both new to it, and they…added a chaos element to our well-oiled machine. It was still fun, but we made lots of rookie mistakes in the games that followed. Our highest score after this was 18, and our lowest was LOSE. But you know what? The game is still a ton of fun to play, even if players aren’t quick about the deduction aspect of the game. I’ve made it no secret that I love Libertalia, so I brought it along to Thanksgiving. A group of four of us played this twice, so it didn’t get as much play as I’d hoped, but the two games I played were excellent. Libertalia is a piratey role selection/auction game of dividing the booty on raided ships. I thought I was playing well, and I did come in second both games, but my sister and my wife each won a game, earning the coveted title “piratiest pirate of all time.” Lots of laughs were had over this one, especially when my other sister kept playing the highest character on the ship when another player chose the Beggar (who takes three doubloons from the player with the highest-ranked character on the ship). I get to play Power Grid usually once per year, at Christmas. 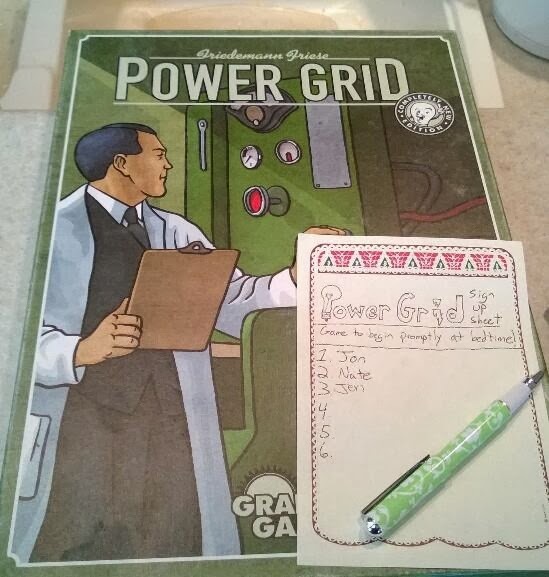 After we missed our annual Power Grid game last year, I asked my brother-in-law to bring this one back, and we made a concerted effort to play. (He made a fancy sign up sheet and everything.) In the end, it was just he, my other brother-in-law, and I at the table (my sister flaked out). We were all a little rusty, but we jumped in, assuming we knew what we were doing. But…we forgot to remove the requisite number of power plants at the start of the game. This added a good deal of length to our game, and there were several rounds where none of us wanted to do anything. This was particularly bad because my mom’s husband was waiting on us so we could go out to Buffalo Wild Wings later that night. So we eventually just said, “Next round we’re in step 3.” (It really should have happened on its own–I promise.) I had stayed in the worst turn-order position for a long time, my brothers-in-law refusing to pass me up until the round before last. In the last round, my brother-in-law N had fourteen power stations built and looked poised to end the game. There was the 30 power plant–3 garbage to power 6 cities–in the market, and it was the only shot I had at winning since all the other available plants were to power 5 cities. So I bid N up when he chose it for auction. And up. And up. I bought the 30 for $75 Electro, recognizing it as my only hope to stay in the game (since the win condition is most cities powered when one player has 17 cities). No other six-city plants came up, so he and my other brother-in-law (M) bought five-city plants for face value, tying all of us in the number of cities powered. N did what I thought he would and built up to 17 cities. I built to 14, trusting that I might have a shot since the tiebreaker is most money. We had a three-way tie at the end of the game (all power 14 cities), but I won the tiebreaker with $204. N had 189, and M had 183. A $21 spread decided the game. There were asterisks all over this game, to be sure, but it was a ton of fun to play regardless, and we decided that we can’t skip another year of the annual Power Grid game. I just heard about Sushi Go! a few weeks ago, and I bought it, though I wondered if it would fill a different niche than 7 Wonders in my collection. (Both claim a ~30 minute playtime on their boxes.) 7 Wonders is fairly simple, plays quick, and has a lot of depth. Sushi Go! takes away much of the complexity and depth but is still a drafting game (with cute sushi artwork). Well, if there was any doubt on the matter, Sushi Go! was the top game of my family gathering this year. People just kept playing and playing and playing it, even my four-year-old niece (though she just chose the sushi she thought looked cutest). That this game was so popular surprised me since my family loves 7 Wonders (which stayed on the shelf the whole weekend). I think what they really liked about Sushi Go! is that the scoring system is transparent, you don’t have to worry about whether you have the resources to pay, setup is quick, and gameplay is super zippy. (We were finishing games in around ten minutes, even with a full complement of players.) I now see the niche for Sushi Go! and I’m glad I bought it. I don’t like it as well as 7 Wonders, but it’s a fantastic entry point to card drafting and is even fun for experienced players. I really like Sushi Go! and it has sort of “replaced” 7 Wonders for me. Easy to take anywhere, and much easier to teach to non-gamers. Interesting to hear that you weren’t really enamored with Council of Verona. Mr. Vasel and a few others have said that it has replaced Love Letter as the current king of micro-games. I regret not kickstarting it now. While I’m talking about micro-games, it’s worth mentioning that Elevenses is a micro-game currently being kickstarted by Adventureland Games, the Aussie publishers of Sushi Go! Replaced 7 Wonders? Blasphemy! 🙂 It scratches the same itch, but it hasn’t replaced it for me. I do enjoy it, though. If it helps, I wasn’t enamored of Love Letter either. Maybe micro games are too short for me? I don’t know, but I do love Coup. I think I like the “filler” game length better than the micro game length. I saw Elevenses, and I love the look, but the cost (because of shipping) is prohibitive for what you get, in my opinion. I’m waiting until it’s in the distribution system. But I will probably get it then on the strong recommendation of Sushi Go. My love for 7 Wonders doesn’t run very deep, so it’s easy for me to look elsewhere. I got burned out on it after playing about 30 times in a single month. At the least, I think I’m over playing with 7 players. Then again, it might just be my group, which has one heavy AP player. As far as card-drafting games go, have you played Among the Stars or Lost Legends? I’m trying to figure out if those would be decent (and more heavily-themed) alternatives. Ah. It really does need to move quickly to be good. I hope it improves for you–it’s a great game! I’ve not played the others. Among the Stars interests me because of its combination of drafting and tile-laying (it matters where you play the drafted cards), but I’ve not had the opportunity to play it yet. Lost Legends doesn’t interest me much, but Tom Vasel LOVES it, as do many others.